How did the idea of machine independence enter the emerging field of software engineering? What does it have to do with logic? 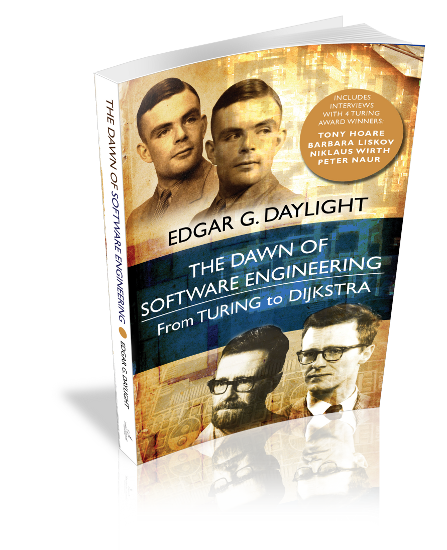 Daylight answers several such questions and discusses them with four Turing award winners: Hoare, Liskov, Wirth, and Naur. E.G. Daylight. Edited by K. De Grave. Includes interviews with Tony Hoare, Barbara Liskov, Niklaus Wirth, and Peter Naur. Available at Amazon.com, -.co.uk, -.de, -.fr, etc (Worldwide), BN.com (US), Alibris (US/UK), Bookdepository (Worldwide), Foyles (UK), The Nile (AU), and many other bookstores worldwide. If it's not in stock at your favorite bookstore, ask the shopkeeper to order from Ingram (US), Bertrams (UK), or Gardners (UK). Edgar G. Daylight has a Ph.D. in software engineering from Leuven (2006) and an MS in logic from Amsterdam (2009). He is currently a post-doc researcher in the history of computing at Eindhoven University of Technology. He maintains a popular blog on Edsger W. Dijkstra at www.dijkstrascry.com.